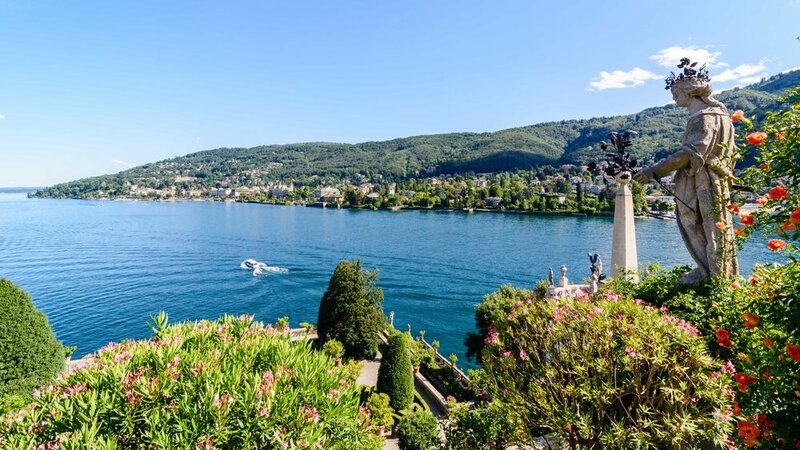 In Lake Maggiore, one can visit the Borromean Islands - Isola Bella, Isola Madre and Isola Superiore - and spend a day among lush gardens and old world palazzos. The Borromeos still exist and yes, they still occupy the villa on Isola Bella some of the year. In fact there was a big wedding not that long ago when a Borromeo heiress married a Casiraghi heir. So the centuries old noble lines continue in the modern world. The Borromeos trace their origins to the 15th century. For the better part of the 16th century, a large chunk of what is now North Central Italy was known as the Borromeo State and the family had political and military power as well as the prime real estate of the three islands in Lago Maggiore which was geographically strategic—located between the Alps and Lombardy—and breathtakingly beautiful. The islands are easily accessible from Stresa which is both a summer and winter resort with skiing (gondola from the village). We visited in the summer, but it’s easy enough to imagine how striking the lake and villages must be with snow-capped mountains surrounding them. Getting there by boat tour. You can get to the islands from Stresa, Verbania, Baveno and Arona. We were traveling via Stresa, and like the other departure points, you can take one of several boat company tours. You can go and book on site - no need that we can see for advance We advise you look at the boats and determine which you prefer. On our first day out of Stresa, we took the first boat company adjacent to the parking structure, and while serviceable enough - the boats were small, less comfortable and very touristy. Day two we learned our lesson and took a larger boat which ended up being the ferry for locals “Gestione Navigazione Laghi”. Facing the water they are on the right side of the port, also check their schedules, since it’s local transportation you can get to all the lake areas effortlessly. There is parking located close to the boat company ticket offices and meters take credit cards - you can select your language of choice and then proceed to choose a time and pay. You can easily spend one day going to all three islands and get that accomplished; however, we broke it up into two days. On day one, we had a leisurely breakfast and drove to Stresa from our home base in Orta San Giulio which is about 40 minutes away. We got to Isola Bella around 11 a.m. and spent two and half hours walking the villa and gardens and stopping for a drink at the cafe as well as a little gift shop shopping. You can make an afternoon of Isola Bella alone, if you want to sit and take in the sights and have coffee and linger in the cafe. We left Isola Bella for Isola Superiore (Pescatore) to have a late lunch and Aperol Spritz among the many restaurants there. Pescatore is a retail island - there are shops and cafes and little else - no gardens. By the time we finished wandering around Pesactore, we decided to wait for the next boat - the boats run on a schedule so you may have to wait a bit - and head back to Stresa and then back to our hotel for a bit of relaxing before going out for drinks and dinner. On day two of our visit to the islands, we started mid-day again, went to Isola Madre and hopped over to Verbania to the Villa Taranto. The latter is a must. If you decide to do all the islands in a day, then save a day for going to Pallanza and around to Villa Taranto in Verbania. (You can drive or you could just use the boats). Isola Bella is the island that the Borromeo still use in warmer months, as the palazzo is not heated. We were there in July and had no problem visiting (I’m sure the living quarters are accessed separately and quite different from the part of the palazzo you can tour). The island is accessible March to October since the winter is snowy and cold. The gardens of Isola Bella (photos above) are stunning with plenty of white peacocks roaming about. The garden reaches 37 meters in height culminating in the “Theater” which features a statue of a Unicorn, the emblem of the Borromeos. The statues flanking the unicorn represent nature and art. The vistas from the Theater are fantastic. If you love flowers - particularly hydrangeas - the gardens are heaven. The unicorn sculpture at the apex of the “theatre” represents the Borromeo’s emblem. The palace was interesting and time well spent, but the gardens are really where you want to be. After the villa and gardens walk through Vicolo del Fornello for small shops with items made in Italy. Isola Madre is the biggest of the islands. Isola Madre overlooks the Pallanza shores and, compared to Isola Bella and Isola dei Pescatori, it is more secluded from view and a bit farther flung. It was the first of the islands to be inhabited by the Borromeo, with the transformation of the island beginning with Earl Lancillotto Borromeo, who choose to settle there for the mild weather. Today the island is renowned all over the world for its garden collection which includes rare species and rotating blooms all year round. The giant Tibetan Cypress tree is a focal point and it has been restored from 2006 when a tornado hit the island - it is still anchored and carefully maintained. Peacocks and pheasants roam freely about the grounds - you’ll hear them and some might give you a bit of a chase! This island was the “worker” island and it’s where you will want to go for some fun tourist shopping, food, drinks. The island is full of cafes and bars as well as shops and sidewalk stands selling tourist items, ice cream, sunglasses, etc.